I just noticed that it’s National Arbor Day here in the U.S. and it gave me a flashback to the launch of something 11 years ago that I’m proud to know is still going strong – Dell’s Plant a Tree program. For a long time, we’ve been committed to helping our customers find new ways to protect the environment, and Plant a Tree is one way we can really collaborate with you on that. You can donate online by simply adding the “Plant a Tree option” to your shopping cart. If you are in a business, simply ask your account representative about adding the Plant a Tree option to your Premier Account. Together, we are having a positive lasting impact in vulnerable deforested areas and important watershed regions like Laguna Atascosa National Wildlife Refuge in south Texas (home to the last remaining breeding population of ocelots in the country) and the Upper Ouachita National Wildlife Refuge in my home state of Louisiana. Not only am I proud to have been part of the team that launched this program when I was responsible for the corporate content on Dell.com, I also got to enjoy bringing it into the virtual world of Second Life (SL) when we had Dell Island there (once one of the top eight corporate sites in SL). 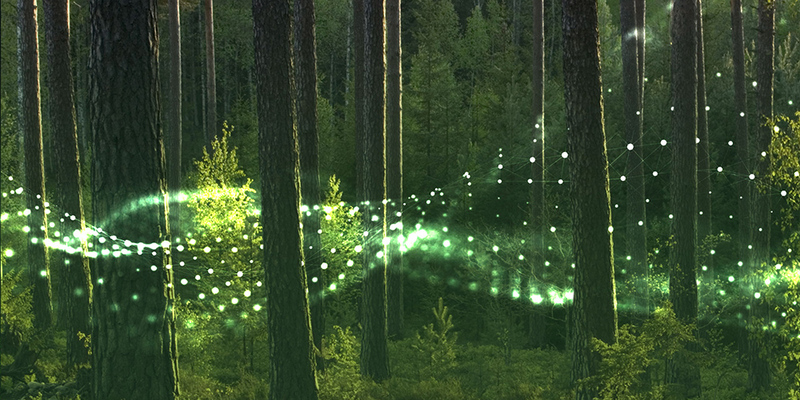 Users could plant the trees on their virtual land and determine the pace at which they grew, and click on them to donate and plant real trees. A tree provides enough clean oxygen each year for two people to breathe. Over a tree’s life, the amount of pollutants it will remove from the environment increases 70 times. Announced by Michael Dell at CES in 2007, within its first year our Plant a Tree program had played a key role in restoring 775 acres of forestland in the Marais des Cygnes National Wildlife Refuge (NWR) in Kansas. In 2008, we set a goal of planting one million trees by 2020 which we reaffirmed as part of our American Business Act on Climate Pledge. By Arbor Day 2012, we were able with our partners Carbonfund.org Foundation and The Conservation Fund to announce that customers had donated more than $2.3 million to plant native trees and restore deforested areas. 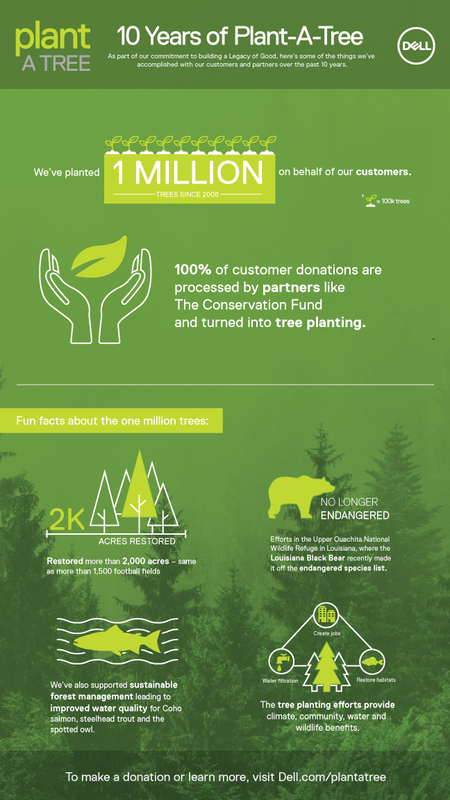 Then last year, we reached our Million Tree Challenge goal – three years ahead of schedule – resulting in the restoration of 2,000 acres … that’s more than 1,500 football fields. Thank you to everyone who joined with us to make that possible. Let’s keep it going! *An average tree grown 16 years will absorb approximately 770 pounds of CO2 – similar to the carbon footprint of a Dell Latitude e6550 laptop.